Accommodation is pleasant and comfortable, where possible. On the way, we sleep in plain guesthouses and youth hostels with double-/multi-bedrooms. Especially when riding or hiking we also spend some nights in simple but clean and warm huts and village halls (mattress camp), old farmhouses and 2-person huts equipped with cooker, cooking utensils and provisions. What does full board mean? As a rule, this means breakfast, substantial picnic or warm lunch, as well as warm dinner. We value typical Icelandic food, whenever possible. 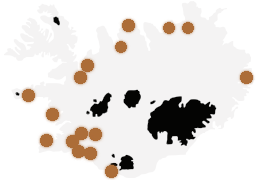 Typically Icelandic – most of all means healthy: Vegetables and salad from geothermic hothouses, fresh fish from the sea or our clean rivers, delicious dairy products which are not mass produced and lamb from absolute free-range animals. En route, there is almost no possibility to spend extra money. But do take along some money for possible short-transfers in Reykjavík on departure-day. In most of our tour‘s is no alcohol drinks included in the tour price and in the highlands it is hard to get, that can be bought at the duty free store at keflavik airport upon arrival. Luggage will be transported in the kitcen van, pack light because transport space is limited, bring bags rather then hard cover suitcases. It is no problem for you to ride a safe horse in all gaits in the country. It is possible to take children or anxious riders into consideration. Comfortable and in control at all paces,firm seat,comfortable in the saddle for 4- 7 hours ride a day. We are riding at a lively pace with free-running horses (pack-horses, exchange horses, young horses) and we appreciate it when our guests help driving and keeping the herd together. We sometimes walk over rough ground without roads or paths. Hiking up to 8 hours a day. Participants should be generally fit and healthy. No previous knowledge necessary. We mostly walk over rough ground without roads or paths, we have to cross rivers and carry luggage (incl. sleeping-bag). Participants should be fairly fit, healthy and steadfast. Comfortable well-fitting waterproof hiking shoes, an extra pair of shoes or boots for crossing especially damp areas as in some tours , slippers, rain-proof clothes (jacket and trousers), hiking-bag, gloves and cap, bathing costume or trunks, sunglasses, sleeping bag (Hiking II only), warm, functional clothing, trekking-rucksack (Hiking II only), hiking sandals or similar shoes for river crossings (Hiking II only).